I just got a Dazz L120 Pro. It's a high resolution DLP printer. Anyhow it looks like a rasp pi controls everything and uses gpio UART to send serial commands to a couple of mystery devices. I'm hoping I can use nanoDLP to control this serial connection and therefore the printer. Images for each slice are sent via HDMI on the pi to an LCD screen. 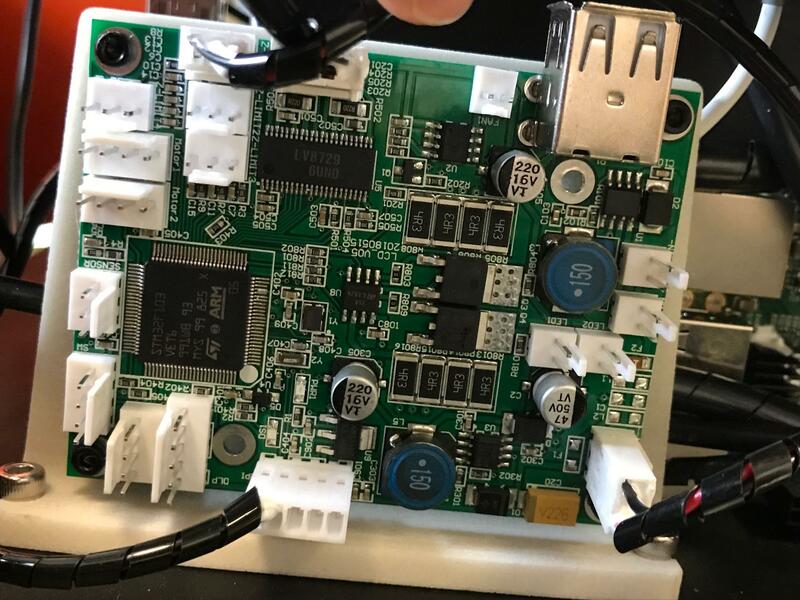 The mystery device looks like it has two USB ports (seemingly providing 5v power, no coms I'm aware of) a z-motor stepper control, 2 other motor controls (4 pin possibly stepper?) 4 z-limit sensors, "MS" (4 pin), "IIC" (4 pin), Power in, power out, LED1, LED2, A UART port labeled RPI, and another labeled DLP, A 2 pin fan controller running a 24v fan, and finally an ARM chip you can see in the picture. I haven't managed to get access to the pi to watch the serial port yet but I suspect it's sending Gcode to this device. In this printer there are two of these boards, one connected to the pi and another connecting the DLP port from the first into the RPI port of the second. I suspect this second controller is receiving commands from the first controller. They're very clearly interpreting serial communication to turn on the LED UV light(s) and to move the steppers (Z stepper and a vat agitation arm). I don't have any reason to believe they're proprietary because there are tons of unused ports on each one and why would you waste all of that space and money to solder on a bunch of crap you will never need. Yes it is faster alternative to Atmel boards. Search for STM32 you can get some RAMPS firmware working with these boards. I was hoping to get some clues as to how the STM32 was programmed. G-code capabilities etc. Any chance you could post a link to someone selling these? I've done the search but it only really talks about the microcontroller of course. Without going through the pain of figuring out how these are controlled I know nothing else about them.